Degree of protection to BS EN 60529 to IP2XC. Precautions must be taken to maintain the IP rating, e.g. Use of cable glands and knockouts. All units are white coloured. 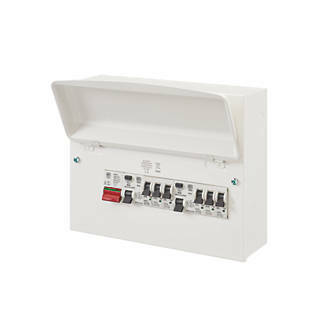 All units are pre-fitted with a switch disconnector and RCD together with all the necessary split-load cabling. The flexibility of design allows the RCD to be positioned to suit the required configuration of RCD protected and non-protected circuits, subject to the rating of either the switch or RCD not being exceeded. MK recommends the use of RCBO’s for non RCD protected circuits to comply with the 17th Edition Amendment 3 Wiring Regulations. © 2019 Blackwater Electrical. All Rights Reserved.